gorgonzola | What's Cooking at the Genua's? Italian cooking is one of the most popular types of cooking around. I don’t know anyone who doesn’t like some kind of Italian food. I love pasta in any shape or form. Ravioli has to be my favorite though. From the sauces to cheeses to herbs to wines to olive oil it seems almost too much to comprehend at times. Everyone knows the basics like spaghetti and meatballs, lasagna, baked ziti, ravioli, chicken parmigiana, veal parmigiana, eggplant parmigiana. And the desserts! My favorite of all time is tiramisu. It’s very hard to find authentic tiramisu. Most restaurants try but don’t come close. The best tiramisu I’ve ever had was actually in Montreal, Canada of all places. Go figure. And of course everyone loves cannolis! I’m getting hungry just thinking about them! 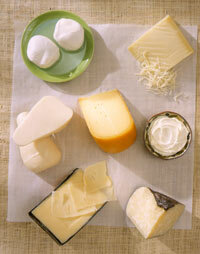 Ok, to start our little journey today I am going to start with a glossary of Italian cheeses. I love cheese. Growing up we always had ‘stinky’ cheese or really sharp provolone. Really sharp provolone is hard to find these days. Another staple in our house growing up was Locatelli Romano cheese. No green can that you keep in the cabinet in my house! On to the cheese! Remember this is just a basic list. There are actually hundreds of different Italian cheeses! But for us Americans this is a good start! You can find low-fat versions of these cheeses at your local supermarket or Italian specialty store as well. Ricotta: Ricotta cheese is usually made from cow’s milk, though it can also be made from sheep’s milk, which has more flavor. The one made from sheep’s milk is not readily available in the United States so you’ll probably always be buying the cow’s milk version. Ricotta is usually a bit grainy in texture with a mild sweet flavor. Depending on whether the milk used in making the cheese was whole or skim, the fat content of ½ cup (4 ounces) ranges from 0-15 grams. FYI: When fresh Ricotta goes through its natural aging process, a hard, pungent cheese, suitable for eating or grating results. This is called Ricotta Salata and is almost white in color. Mozzarella: Mozzarella is best known as a pizza topper. It is made from either cow’s milk or in Italy, from water buffalo’s milk. It is milk in flavor and can be found in low-fat varieties as well! Fresh mozzarella is a real treat. It’s made from whole milk and has a softer texture and sweeter, more delicate flavor than regular, factory made mozzarella. It has 4-7 grams of fat per ounce, depending on the fat content of the milk used to make it. No Italian meal is complete without freshly grated cheese. Or in my house it’s any meal, not just Italian meals. We like it to snow on our food! Pecorino: This is made from sheep’s milk and the flavor of pecorino will depend on the area where it was made in Italy. It ranges from a firm, sharp, salty cheese to a milder, semi-firm variety. It has about 110 calories and 7-8 grams of fat per ounce. Locatelli is a pecorino romano cheese and the choice at my house. Has been since forever! Pecorino Romano: Pecorino Romano is made from sheep’s milk. It is straw-white in color and has a sharper flavor than the other cheeses listed here. 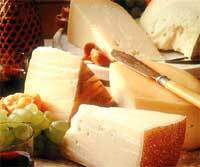 Although it is sometimes called “Locatelli” Locatelli is a brand name of Pecorino Romano. Pecora in Italian means sheep and Pecorino Romano is one of Italy’s oldest cheeses. Legend has it that a shepherd filled his flask with sheep’s milk before a long trip and the motion during the trip caused the milk to naturally ferment. The idea for a new cheese was born. Today most Pecorino is made in Sardina Italy. With its fine flavor Pecorino’s popularity as a grating cheese has grown significantly in the U.S. Since sheep only give milk for 6-7 months a year all production must satisfy the public’s demand for the entire year. 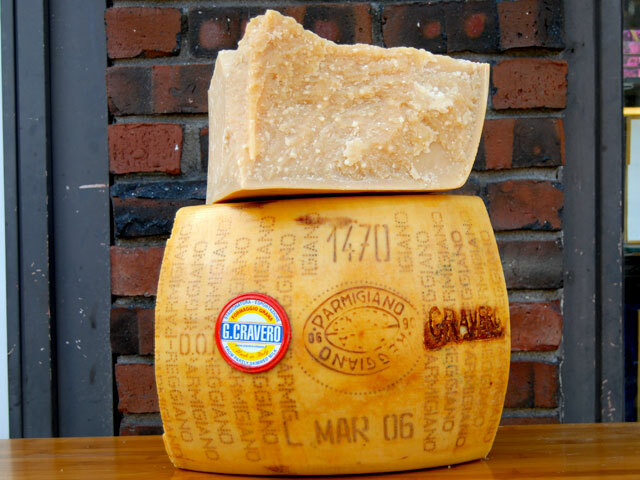 Parmesan Cheese: Parmigiano-Reggiano cheese is the Ritz of parmesan cheeses! It is an aged hard cheese made from cow’s milk and is strictly regulated in Italy. This is to control the quality. In the U.S., this cheese is often limited, but the results are different from the Italian cheese. Older, aged varieties from Italy have a stronger flavor and are drier. Stick to freshly grated aged varieties for the most flavor. You’ll be able to use less due to the more intense flavor. It has about 110 calories and 7 grams of fat per ounce. Parmigiano-Reggiano is also very expensive. I have found excellent varieties at a few places, such as BJ’s. The price is still high but a little less painful. Same goes for the Pecorino cheese. In Italy it is so valuable that trucks carrying a load of Parmigiano have been hijacked at gunpoint! Asiago Cheese: Asiago is made from cow’s milk. It’s a semi-hard to hard cheese. (My cat Gus loves it! Really!) It is full of many time holes and has a rich flavor and creamy texture when it hasn’t been aged for very long. As it ages, the cheese becomes firmer and can be grated easily. It can also be eaten by itself. It’s similar in fat content to Parmesan cheese. Asiago is from the Veneto region. Fontina: This is a delicious delicate, sweet, semi-soft cheese with a nutty flavor. It’s also made from cow’s milk and melts easily and smoothly. The more aged the cheese, the richer the flavor. One ounce has about 110 calories and 9 grams of fat. Gorgonzola: Gorgonzola is a blue-veined cheese made from cow’s milk and has a creamy texture with a slightly pungent, rich flavor. When aged for more than six months, the flavor can become very strong. It’s a great match with fruit, such as apples or pears. 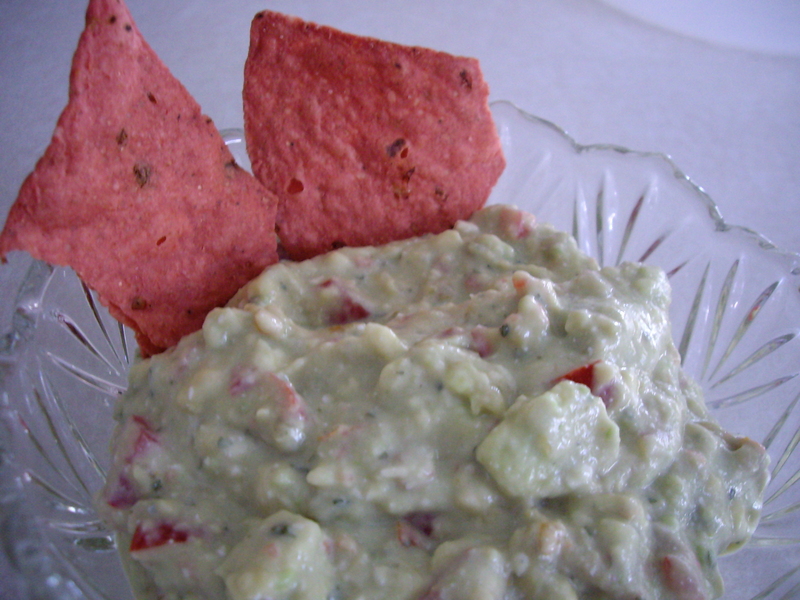 It also can be melted into sauces or crumbled over salads. For a milder variety, look for torta di Gorgonzola. This layers Gorgonzola with sweet marscapone. Gorgonzola has about 100 calories and 8 grams of fat per ounce. Marscapone: Marscapone is super-rich and tastes like a cross between cream cheese and whipped butter. It’s usually used in desserts but it’s also great as a spread for delicate crackers or fresh fruit, such as strawberries and pear slices. It’s a soft cheese made from cow’s milk and has about 124 calories and 13 grams of fat per ounce. Not exactly a cheese for diets! Provolone: Provolone is another cow’s milk cheese. It is delicate and creamy when aged for up to two months. When it’s aged longer it begins to take on a spicy, sharp flavor. Most people use provolone as a table cheese with crackers, pepperoni, apples etc. but it’s also an excellent cooking cheese. Aged provolone can be used for grating. One ounce has about 100 calories and 8 grams of fat.